UFC flyweight champion Demetrious Johnson made easy work of top contender Wilson Reis on Saturday night at UFC Fight Night from Kansas City as he took home his 10th straight UFC championship belt. Here are some options for what’s next for Johnson and the rest of the big winners from Saturday night. 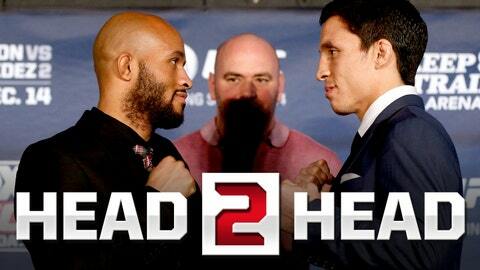 It’s been over three years since Joseph Benavidez lost to Demetrious Johnson for the second time, and I’ll say the same thing I said after Benavidez’s win over Henry Cejudo -- it’s time for Benavidez to get another shot. Rose Namajunas appears to be living up to the immense potential she showed early in her UFC career and stamped her ticket as the next challenger to the UFC strawweight belt. Namajunas put an impressive beating on streaking strawweight Michelle Waterson for her fourth win in her last five fights, three of which have come by way of submission. Robert Whittaker continues to prove he’s one of the scariest strikers in the middleweight division with his second-round finish of longtime contender ‘Jacare’ Souza on Saturday night. 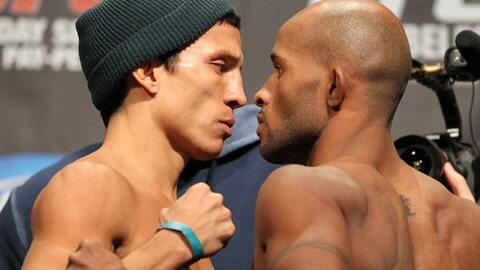 For his efforts, Whittaker was granted a spot in the looooong line of contenders for the middleweight belt. Right now, Yoel Romero stands in the front of that line but he’s got to wait until champion Michael Bisping fights returning former champ Georges St-Pierre. Behind Romero is probably Gegard Mousasi, who has won five straight but likely isn’t keen on sitting around waiting for the confusion in front of him to clear up. I’d like to see these two expert strikers throw down to determine who gets to fight for the belt after Romero … likely sometime in 2018. Previously unranked Renato Moicano accepted a huge jump in competition against fifth-ranked Jeremy Stephens and he was more than ready for the challenge as he walked away with a split decision win and, most likely, a spot in the 145-pound top 10. That doesn’t mean it’s time to pit the Brazilian grappling specialist against the rest of the division’s top 5 just yet. I’d like to see him face off against someone a bit more well-rounded, first, and I think Chan Sung Jung is a good option at this point in his career. Jung is coming off a first-round finish of now-10th ranked Dennis Bermudez in his first fight in almost four years and could use another win before taking on the featherweight top 5. The winner here would be granted that opportunity.